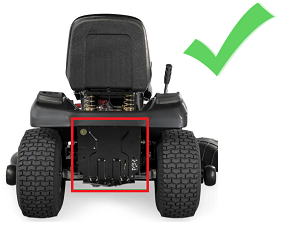 If you have a flat hitch with at least a 10.5″ by 6″ flat surface like the mowers pictured on this page, then you can attach the Mower Boss as is. If your mower does not look like this, you can attach a 12″ by 8″ piece of sheet metal to the back of your mower and then attach the Mower Boss to that. MowerBoss products are designed to be used on riding mowers with a straight (i.e. non-sloped) rear drawbar. This includes most LT and YT products from Deere, Craftsman, Husqvarna, Cub Cadet, Troy Bilt, etc. 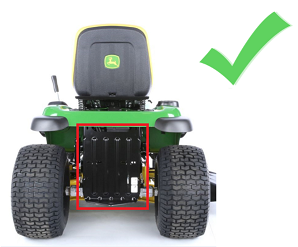 (1) Verify your mower has a straight rear hitch plate similar to the ones in the picture to the right. (2) Verify the dimensions of this rear hitch plate are at least 10.5″ (W) x 6″ (H), and it is made of heavy duty steel. (3) Download the drill hole template #1 or #2, print it out, and tape the 2 pieces together. [Note: Kits manufactured after Feb 2015 have a simplified design and can use the 1-page template included with the kit. ](4) Place the drill-hole template on the rear hitch plate to see where the mounting bracket drill holes are required. (5) Verify there are no objects located directly behind the drill locations ( such as a gas tank ) and make sure you can get a wrench behind the rear hitch plate to allow you to tighten the mounting bolts. The default drill hole template places the two upper mount brackets 10.5″ apart (horizontally) and the lower mounts 8.5″ apart (horizontally). The upper and lower mounting brackets are spaced 6″ apart (vertically). Is there an obstruction at the location where the drill hole is required? The Mower Boss mounting design allows the horizontal spacing of the upper and lower mounts to be custom to your specific mower. 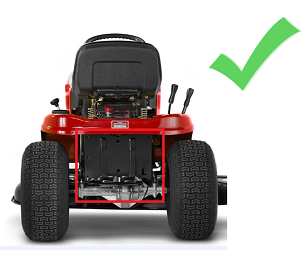 The default horizontal spacings works fine for many mowers but in some cases you will need to adjust this spacing to fit your mower.